Comal de fierro Redondo #2 / Round Skillet Comal #2 Metal Griddle plate to make tortillas and blister the chiles, a nationwide online grocery store for authentic Mexican food, Mexican recipes, cookbooks and culture. 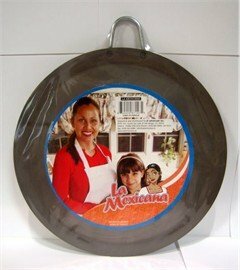 If you have any questions about this product by La Mexicana, contact us by completing and submitting the form below. If you are looking for a specif part number, please include it with your message.